If you ever played the iPhone game Angry Birds, you just might find many similarities with this PC game. 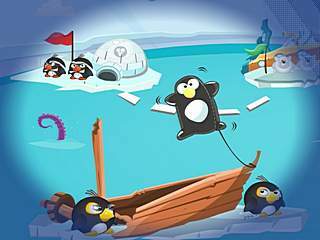 Pengu Wars take you to the world of penguins showing you all of the challenges they face in theri everyday life. The game is full of different arcade-based activities trying to make it fun for you. You just shoot each other using a giant sligshot. I said trying because there are way too many similarities with the above-mentioned game about birds. The graphics of this game are really cute, though very simple. And it was hard to ignore or not to mention when you can see a lot of what is being released on the market daily. So the story behind the game is not crazy commplicated. 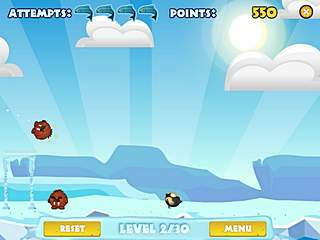 You are to fight with the penguins' enemies. The enemies here are theives of three groups, which include walruses, Emperor Penguins, and the other ones that look like giant white snow hamsters. Things go pretty simple with fighting with the enemies in their world. You just shoot each other using a giant sligshot. The shooting is absolutely phisics-based, when you use your mouse to set the trajectory of the shot. Some of the penguins have some special powers that get activated when the penguin is in the air. One of the powers boosts the speed the other one covers a bigger area. There is this old fashioned system of limited lives which means you start out with four lives and if you run out of all of them, you start all over again. There is one more feature in this game that is aimed at entertaining you. You can build customized levels. But after saving them there is no way to send to someone or make it a part of the main game. You just play it for yourself if you want. There isn't much to the game, but if you are still not sure about it you can always try the free download first. This is Pengu Wars review. Download this game here.